As you will well know if you have followed Iron Maiden outside of their music over the last decade or so, Bruce has become a qualified commercial pilot (with well known outings on Ed Force One being available for some fans when the band is on tour). However, news has surfaced of Bruce performing some extra special flights, by flying home a Boeing 747 that had been chartered to take a large group of RAF pilots for their annual leave. Many of the servicemen were huge Iron Maiden fans, and he spent a long time before and after the flight talking to those who had travelled and signing autographs. With Iron Maiden’s up coming concert at Twickenham Stadium, Planet Rock – the UK’s classic rock station is featuring a number of on-air specials on this legendary band. In June as part of Iron Maiden month, Planet Rock presents new and exclusive interviews with singer Bruce Dickinson. Recorded in May 2008, Bruce Dickinson talks to Nicky Horne about the new album “Somewhere back in time” and his life in Iron Maiden. There will be two Set List Specials with some of Iron Maiden’s best live recordings. The month also includes an hour long feature from the fans point of view on the band. Bruce returns again with an hour show on his musical influences and picks some of his favourite Iron Maiden tracks. Online - Planet Rock’s website there will be a chance to win tickets to the Twickenham show, signed albums and more. Maiden will be finishing their 2008 touring schedule in Russia at Moscow's Olympic Stadium on Tuesday August 19th. This will be the first time the band have visited the Russian capital since June 1993, 15 years ago. This will be the last show in 2008 so much consumption of vodka is to be expected after this show. Tickets for these shows will go on sale to the public immediately today - Friday 18th April. Posted on the official Iron Maiden site today comes the news that Banger Films, producers of the forthcoming Iron Maiden Somewhere Back in Time documentary, want to see your home videos. Directors Scot McFadyen and Sam Dunn will review all videos. If selected, fans will be contacted with further details. 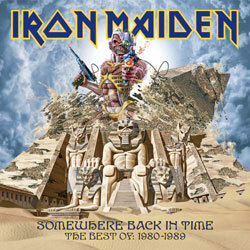 Somewhere Back in Time Album Available for Pre-Order! Amazon have today added the new compilation album 'Somewhere Back in Time' to their stocklist and made it available for pre-order at the reasonable price of £11.99. There is no information any possible different versions yet such as the promised 2 disc picture set, although we are sure they will be added in time. Although the not the first retailer to stock the item (Maiden favourites What Records had it available for pre-order from when it was announced), they are one of the biggest so far. If you have not reserved your copy for it's 12th of May release date, then there is no better time than now to do it, so head on over the Amazon page for the item by clicking here and pre-ordering it to ensure you recieve it on the release date.